If I needed a reminder, I got one. 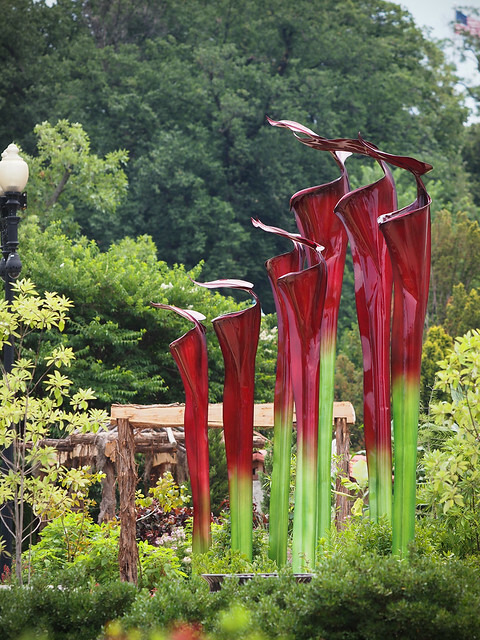 In the form of GIANT RED pitcher sculptures in front of the U.S. Botanic Garden. I started writing this post months ago, but it sat in draft form while I gradually added information. It's now a very long post, hence the "Note" up top. What we -- gesneriad enthusiasts in the Washington, DC area -- don't get to do is write about native gesneriads. Why? Because there are no gesneriads native to this area. If you go as far as Hawai'i, you might find a few Cyrtandra species, and of course there are some gesneriads in Puerto Rico. We've got some spectacular natives, though. For example, there's a prickly pear cactus (Opuntia humifusa) that grows throughout a huge range including the DC area. There's also a passion flower that's native around here: Passiflora incarnata. But let's get back to why I started writing this post. Just before blooming season, Kenneth Moore and I went to visit Meadowview Biological Research Center. The headquarters is a little house outside of Fredericksburg, Virginia, with a small greenhouse and some propagation beds. 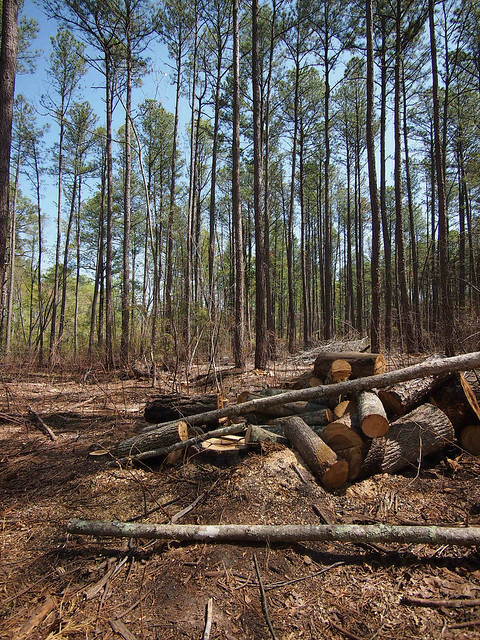 Their activities, though, include conservation efforts and habitat restoration in a nearby area as well as the Joseph Pines Preserve south of Richmond, Virginia. 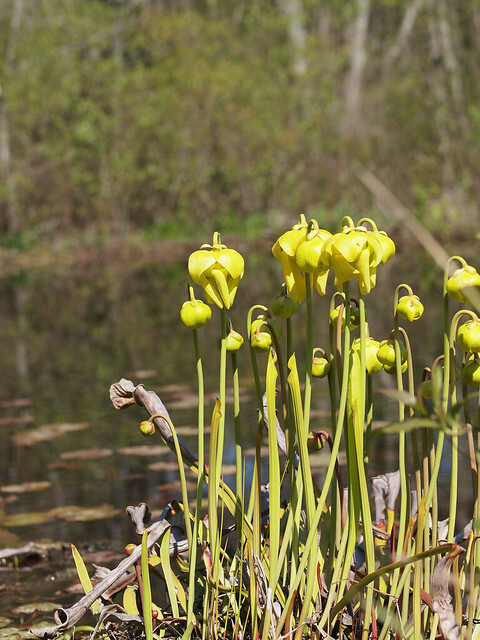 In his book Pitcher Plants of the Americas (The McDonald & Woodward Publishing Company, 2007), Stewart McPherson identifies three main causes of habitat loss: artificial drainage (for agriculture); fire suppression; and commercial tree farming. In addition: urban expansion, highway construction, and fertilizer/pesticides/chemicals. Both this book and another on my shelf, Carnivorous Plants of the United States and Canada by Donald E. Schnell (2d ed. Timber Press, 2002) discuss habitat loss and conservation issues in detail, although the bulk of both books is information on various species. 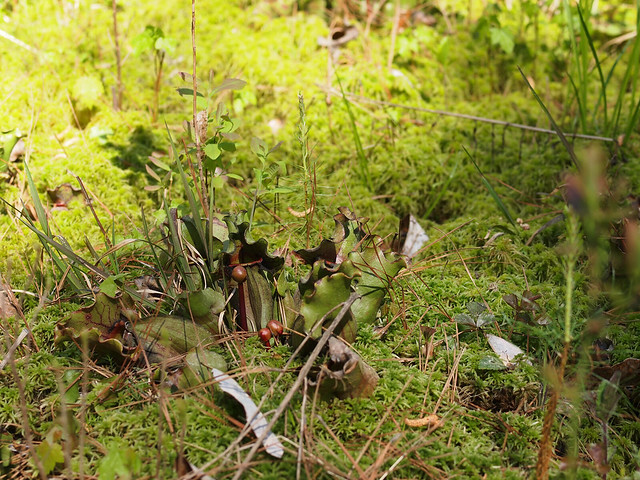 I wanted to show you in situ photographs of S. purpurea, but my search found them growing wild in the Lake District -- yes, that's across the pond in the northwest of England, and no, it's not native there. 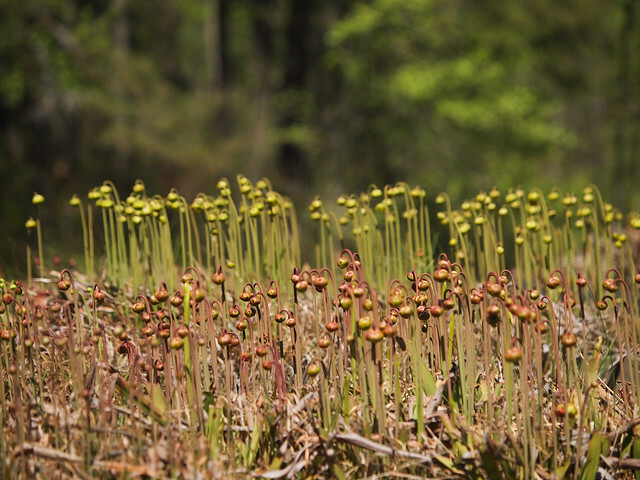 Sarracenia2 on Flickr has a set of in situ photographs of various species, like this field of S. leucophylla in Alabama. 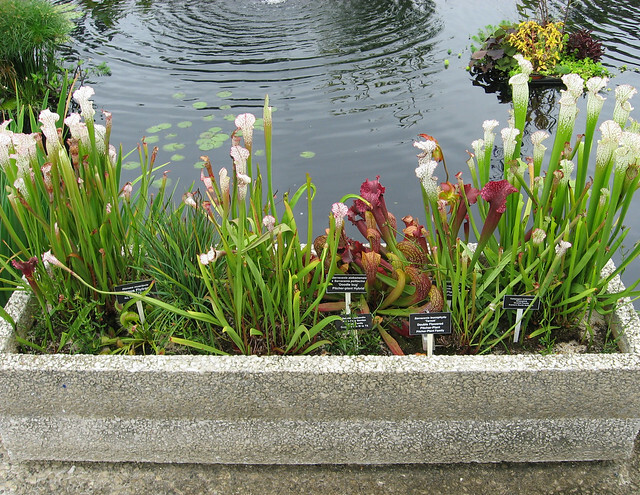 For more information on Sarracenia (and other carnivorous plants), check out the two books above. 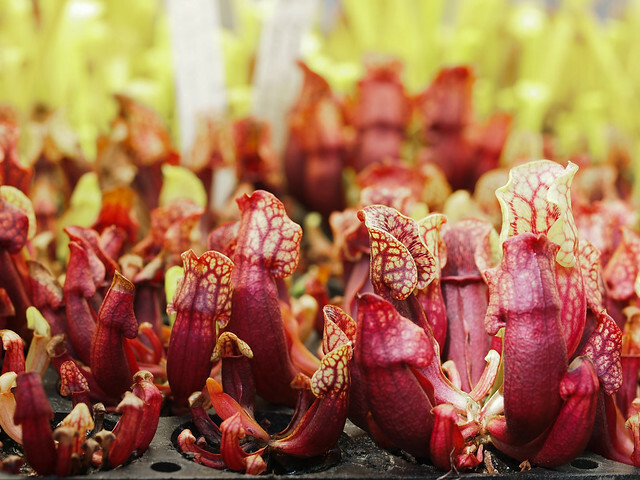 On growing these plants at home, there's an excellent short article on Plant Delights' website, as well as a section in Peter D'Amato's book, The Savage Garden: Cultivating Carnivorous Plants (Ten Speed Press 1998).